Garmin’s Nuvi line of GPS devices offers voice command support and combines visual mapping, turn-by-turn driving directions, reliable hands-free voice commands, and phone dialing. It also offers Mac-based trip planning via the free RoadTrip 2.0.1 software. With these features, Garmin has built the ultimate travel companion. It shows your current position on a large, detailed map, gives you driving directions as you progress toward your destination, and recalculates your route if you still manage to get lost. Garmin's Nuvi hardware is an ideal companion for the company's Mac-based software, RoadTrip 2.0.1 (we tested RoadTrip with the Nuvi 880, which was recently discontinued), and we use it as an example for this review. However, RoadTrip is compatible with just about all other Garmin GPS devices. Garmin RoadTrip, a desktop application, allows you to interact with the Nuvi’s maps, using your Mac for trip-planning and off-road research. With RoadTrip, you can set up less direct routes that include stops at points of interest along the way (route-building on the Nuvi 880 model was geared more toward rapid, direct routes). These points of interest, known as waypoints, can be labeled as you see fit, so you can create waypoints with names like “Grandma’s house” or “overpass with a great view of the bay.” RoadTrip lets you preview and compare your routes before you embark, and record your new discoveries when you return. While RoadTrip’s search features are very basic, it’s a handy way to prepare for a trip—and take that research along with you. When your trip is finished, RoadTrip makes it fun to review all the places you went. By importing track logs from your GPS, you can see the routes you took, how long you stayed in each place, and how you deviated from your planned route. You can attach a digital photo or other file to each waypoint you collect, too. If other travelers followed the same trip plan, RoadTrip can review their track logs side by side with yours. The main purpose of trip planning is to spend as little time traveling to each destination as possible—or sometimes to take the most scenic route. That’s why you’ll want to use RoadTrip to set up your routes before departure. For example, our Nuvi 880 sent us on an unnecessarily long, diversionary route from Cleveland to Sandusky, Ohio. Had we consulted RoadTrip before embarking, we would’ve reached Sandusky in two-thirds the time and saved a few bucks on fuel. By itself, a Garmin navigator will get you to your destination, but it may not do so in the speediest, or most scenic, manner. RoadTrip will help you establish the route that’s right for your journey. In tandem with the Nuvi 880 navigator (or other Garmin GPS devices), Garmin’s RoadTrip application provides excellent tools for planning routes and reviewing the trips you’ve recorded. Once on the road, you’ll notice that an automotive GPS’s map display is entirely different from the flat, Google Maps-inspired view provided by RoadTrip. The Nuvi 880’s map display could be viewed from the top down (2-D) or from the driver’s perspective (3-D), and could be set to lock its top edge to north. The color scheme of the map could be adjusted to optimize visibility during day and night driving situations, and the display’s brightness could be set to automatically adjust depending on the time of day. While traveling, the 880 gave us spoken prompts indicating how far we were from each intersection and which way to turn. The Garmin’s spoken prompts can be adjusted to suit your preferences. Several sets of male and female voices, with dialects ranging from American English to Australian English, are included, and you can download more from Garmin’s Web site. These voices, and other add-ons, are loaded by connecting the device to the Mac’s USB port. 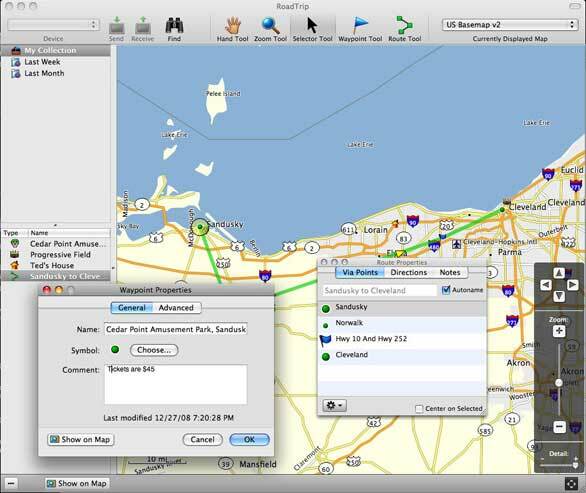 For travelers who require a lot of different maps or who need frequent updates, Garmin provides Mac-compatible software utilities called MapInstall and POI Loader. The best reason to use a Garmin GPS is the company’s fantastic Mac software. Garmin is the pre-eminent producer of GPSs, and its RoadTrip package is the leader of its pack, too. Garmin offers its users a superior route-planning and review tool with RoadTrip. The other packages such as RouteBuddy may look more attractive or, like MacGPSPro, have more research tools, but since RoadTrip is free, most Garmin users won’t want anything more. RoadTrip 2.0.1’s simplicity and free price tag, combined with the Nuvi hardware series we tested it with, makes the Garmin GPS system a clear winner for Mac users. No other GPS manufacturer offers a more complete solution for trip planning, navigation, and trip review.